HomeTo what extent does Bloom’s taxonomy actually apply to foreign language teaching and learning? 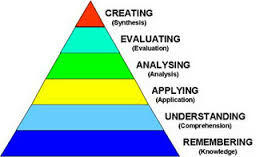 To what extent does Bloom’s taxonomy actually apply to foreign language teaching and learning? Bloom’s taxonomy of higher order thinking skills has acquired a mythological status, amongst educators. It is one of those reference frameworks that teachers adhere to with some sort of blind allegiance and which, in 25 years of teaching, I have never heard anyone question or criticize. Yet, it is far from perfect and, as I intend to argue in this article, there are serious issues undermining its validity, both with its theoretical premises and its practical implementation in MFL curriculum planning and lesson evaluation in school settings. Why should we be ‘wary’ of the Bloom taxonomy, as the ‘alarmist’ title of this article implies? Mainly because people forget or fail to consider that the Bloom Taxonomy was not meant as an evaluative tool and does not purport to measure ‘effective teaching’. In fact, the book in which the higher order thinking skills taxonomy was published is entitled: Taxonomy of Educational Objectives: The Classification of Educational Goals. However, in the last twenty-thirty years, the taxonomy has often been used in UK secondary school to evaluate teaching performance and how effectively students are engaged in higher order thinking skills. The main problem lies exactly here, the hierarchy that Bloom and the authors of the revised version (Anderson et al, 2000) devised being not necessarily a valid construct, especially not from a Foreign Language acquisition perspective rooted in sound Cognitive theory. Creating: Putting elements together to form a coherent or functional whole; reorganizing elements into a new pattern or structure through generating, planning, or producing. Creating requires users to put parts together in a new way or synthesize parts into something new and different a new form or product. Evaluating: Making judgments based on criteria and standards through checking and critiquing. Critiques, recommendations, and reports are some of the products that can be created to demonstrate the processes of evaluation. Analyzing: Breaking material or concepts into parts, determining how the parts relate or interrelate to one another or to an overall structure or purpose. Mental actions included in this function are differentiating, organizing, and attributing, as well as being able to distinguish between the components or parts. In modern language learning all three levels equally require ‘depth of processing’ and the processes that underlie these three cognitive skills often unfold concurrently and synergistically in our brain. Think about the process of writing an argumentative essay in a foreign language: is generating ideas about a given question/topic a higher skill than evaluating their degree of relevance to that question/topic, as well as their suitability to the task and audience? Aren’t the two levels so closely interwoven for anyone to be able to separate them? And how can one determine which one is more cognitively demanding than the other, especially in a foreign language, where evaluating the accuracy of the grammatical, lexical and sociolinguistic levels of the output is extremely challenging? It is my belief that the two sets of processes and even the third one, Analyzing, are parallel in foreign language processing rather than sequential. Let us consider, for example, the task of inferring meaning from a text containing a fair number of nouns, verbs, adjectives and discourse markers unfamiliar to the learner. The task demands the learner reader to analyze how each word relates to another syntactically and semantically (in terms of meaning); every time an inference is made about the meaning of each unfamiliar word, he/she will be creating meaning; every inference’s correctness needs to be evaluated. There you go! You have the three higher order thinking levels co-occurring in the execution of the same ’humble’ task – a reading comprehension. Yet, one wonders whether the average curriculum planner or non-linguist observer would perceive that task as ‘hitting’ the highest level of the Bloom taxonomy. This brings us to the biggest issue with the way the Bloom taxonomy is used in education: the misinterpretation or failure to understand the true nature of language learning and the cognitive mechanisms that regulate it at various developmental levels. Being creative in Modern Foreign Language has to do less with content, tasks and production of artifacts, at lower levels of proficiency, than with creating hypotheses about how the target language works, risk-taking (creatively seeking opportunities to test those hypotheses), coming up with communication strategies (creatively compensating for lack of knowledge of foreign language words), figuring out by oneself better ways to learn (creatively applying metacognitive strategies). The mistake often made by some language teachers is that they equate creativity in language learning to getting students to create a digital artifact or a language learning game; these activities tap into creativity but not the type of creativity that is conducive to greater linguistic proficiency. I will come back to this point later on. Another important problem relates to the way humans process language in foreign language comprehension or production. The way learning occurs along the acquisition continuum is such that the brain gradually automatises the cognitive skills subsumed in the three categories the Bloom taxonomy places at the bottom of the pyramid. This process of automatisation speeds up the brain’s performance during language production so that cognitive processing can concentrate only on the higher levels of processing (analyzing, evaluating and creating) while executing the lower order levels ‘subconsciously’. Thus, for instance, in speaking, an advanced learner, having automatized the lower order thinking skills, will have to focus all his/her cognitive effort only on the top half of Bloom’s pyramid; on the other hand, beginner-to-intermediate learners will have to juggle demands from all six levels with potentially ‘disastrous’ consequences for grammar, pronunciation and accuracy in general. The obvious corollary is that engaging less proficient learners at the top three levels of the taxonomy in language learning can indeed happen, but through less cognitively demanding tasks in terms of processing ability. Furthermore, a very important issue relates to the pressure many teachers feel to be working at the higher levels of the Bloom taxonomy as much and as often as possible, especially when they are being evaluated by course administrators. This is understandable but wrong and unethical on their part, when it comes to foreign language learning, as the nature of L2 acquisition is cumulative; jumping from one level to the next must be justified by the learners’ readiness to cope with the cognitive and linguistic demands that that level places on their procedural ability. Once one level is acquired, one can move to the next, each level providing a scaffolding (in Vigostkyan terms) for the one/ones immediately above. If a teacher feels that the learners are still ‘stuck’ at a level which needs more extensive practice, class work should stay at that level and it would be ethically wrong to move any higher merely to hit the top of the Bloom taxonomy. Finally, and more worryingly, some educators posit that Puentedura’s SAMR mirrors the Blooms’ taxonomy, and fancy diagrams circulate on Twitter and teachers’ networks making the link explicit, further damaging teachers’ perception of what is expected of them in the 21st century Modern Foreign Language classroom. But does such overlap between the two models, actually exist? Does Bloom’s notion of Creative thinking overlap with Puentedura’s Redefinition? The answer is that the creation of a complex high tech product through ‘App-smashing’ or other digital media can only engage Creative Thinking with and through the target language in highly proficient learners, but categorically not at lower levels of linguistic fluency and cognitive ability (see my article “Of SAMR and SAMRitans” on this blog for a more extensive treatment of this point). Only at advanced levels of linguistic proficiency can Redefinition be seen as overlapping with the highest order thinking skills in Bloom’s taxonomy. In conclusion, Benjamin Bloom’s model, especially in Anderson et al’s (2000) adaptation, should be used for what it was meant to be: as a holistic classification of the different objectives that educators should set for students across the cognitive, affective and motor domains of learning. 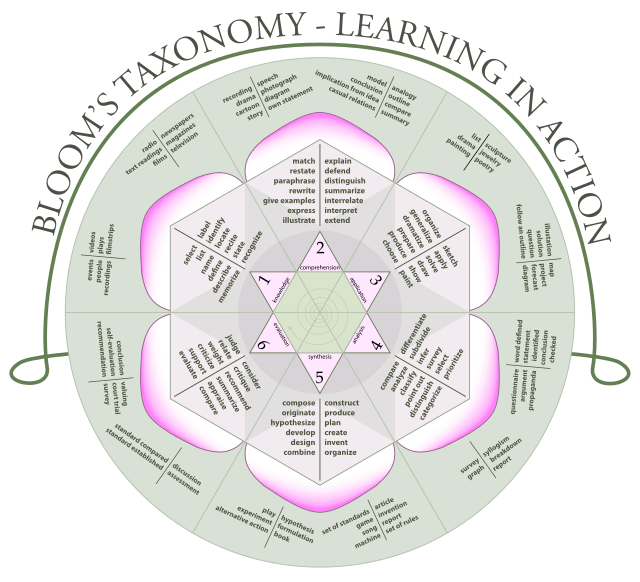 Bloom’s wheel (see picture below) was meant to help curriculum designers and teachers keep in sight the scope and main goals of effective learning. But Bloom was not an L2-acquisition expert and created this model before Cognitive psychologists of the likes of Eysenck, MacLaughlin, Baddeley and others unveiled the mechanisms involved in foreign language acquisition and processing and how Working Memory operates. Foreign language teachers must be wary of any approach that straightjackets their efforts to enhance their students’ ‘healthy’ linguistic development by prescribing vertical progression at all costs. There are developmental stages in language learning which must be consolidated ‘horizontally’, so to speak, before we climb any cognitive ladder in the name of intuitively appealing pedagogic constructs. Horizontal progression is about developing Working-Memory processing efficiency (i.e. procedural knowledge), that is, the learner’s cognitive ability to cope with the huge demands that L2 comprehension and production put on his/her brain and motor-sensorial functions as he/she decodes, generates, retrieves or transforms knowledge into discourse under real operating conditions. ← How does personality affect foreign language learning? Finally, the application of Bloom’s Taxonomy to language learning is being questioned publicly. In earlier times, educators were adamant that language teachers need not concern themselves with the higher domains of the taxonomy. Now, it seems that we may be emerging for Benjamin Bloom”s long shadow. Gianfranco Continue is a fine critic and takes nearly 30 years of thinking head on. Reblogged this on The Language Gym. I am new to language teaching and also new to this Bloom’s taxonomy. I heard this term only two weeks ago when I showed a French teacher my lesson plan. She told me about this term and said my first Mandarin lesson of teaching 10 family member vocabulary to students was too low on the ladder. But I thought for Mandarin beginners, if they can learn to read and write those words in one hour, that is pretty tough as it is not a easy language to learn. Extremely interesting article. Thank you! Thanks. A comment and a question. I did not know the taxonomy was being used as an evaluative tool. That was very interesting. Perhaps that’s not done in ELT, which is why I did not know about it. I do use the taxonomy often, but as a framework of critical thinking for generating questions, especially for reading. I have students make questions for each level. At the higher levels I can literally see how much cognitive effort it takes to develop questions, amd I have also noticed tje overlap of levels. So, I tell students a question can be at multiple levels. You idea of language proficiency and being ready to work at different levels is interesting. How does this work for adults who can operate at the high levels in their L1 but have low L2 proficiency? Do you have any research about this to back up your claims? Reblogged this on Teacher Zara Blog. When you refer to other posts you have made, eg on SAMR, could you link them so they are easy to find? You’ve only been blogging for less than a year so not too difficult right now but the search will become more cumbersome as you continue! I have recently been on a course which looked ar Bloom’s and thought it is a useful to look the level of questioning. I am no expert in this field but have accepted that unless the classroom activity is in L2 then I will be wasting valuable and precious time. However, from the course I did feel challenged to think about the ‘stretch’ in terms of challenge in my activities. For instance, if a student has finished a particular task at a lower section of Bloom’s, such as remembering, I tend to give additional tasks based on the same sort of activity and I was challenged to think of considering tasks that move up the taxonomy. Thank you so much for another challenging and interesting post. I have also always taken issue with translation being seen as a lower level skill. This may not be part of the original Bloom’s Taxonomy but I have definitely seen translation as an activity idea for the “application” level. It can be “application” level if translation is being used to practise a grammar point that has just been taught, but if students are translating a text with a variety of vocabulary and structures they are using a wide variety of higher level thinking skills to do this. I’ve wondered about this, and had very similar thoughts, paticularly on how hard it is to slot the processes of learning language into the various categories – when learning grammar learners are often bouncing up and down and all around the taxonomy – creating, evaluating, knowing, all simulataneously. However, Bloom’s taxonomy is more or less held in such high regard where I work that to question it is verging on the heretical, and the lists of verbs (such as those in the rose above) have been widely shared as “best practice” meaning that teachers create learning outcomes which use the verbs (describe, evaluate, etc.) but then describe a task rather than thelanguage learned. Couple this with measurability and you end up with some very odd learning outcomes indeed. So thank you for thinking this one through much more thoroughly and with references! Glad you enjoyed the article Sam and thanks for the kind words and for dropping by. In the school where I work some parts of this blog where not well received either at first but then people came around. I cautiously agree with what you have said. I strongly believe that unless someone who is familiar with L2 acquisition, then s/he should avoid using Blooms as an evaluative instrument. I believe Bloom’s is a valuable that should be used to help teachers of all contents reflect on their teaching practices however, as someone else indicated, this can lead to come rather odd learning targets/objectives. For us modern language teachers and supervisors, we need to understand and apply Bloom’s through the lens of language acquisition. I agree with the author’s example of a reading comprehension activity that requires a student to operate at different levels of Bloom’s simultaneously. 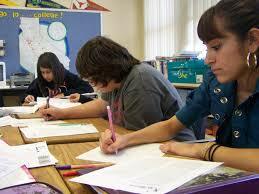 Another example for me is when the teacher remains in the target language (90% or more). 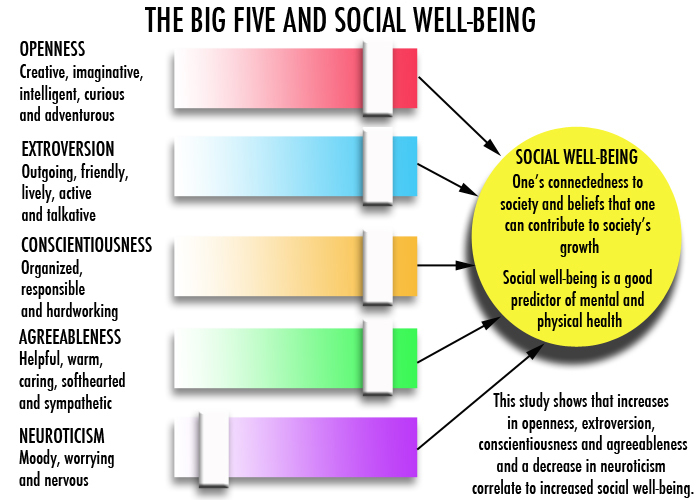 This require students to analyze, comprehend, and evaluate all at once within a split second of receiving the input. I am in the process of developing a professional development course that looks at Bloom’s through the lens of language acquisition and classroom activities/practices and how teachers can apply it to daily instruction and planning. Thanks for the article. A good read with solid insight. Today I attended another CPD session in which we were asked to come up with an idea for our curriculum area MFL, at the deep learning end of the taxonomy….I sighed audibly in the room. I have a class of beginner adults. Someone came up with some shoe horned example in which the use of the target language to set up would have been impossible. I disappear!